The cruise industry recognizes the potential of augmented reality. Reports and projections often talk about AR technology in industries like tourism. They don’t often talk about what that means or how it gets there. So how does AR technology become part of a business’s marketing layout? Celebrity Cruises is a cruise line that offers trips all over the world. Like in any other industry, Celebrity Cruises faces competition from other businesses. Unlike companies in other industries, Celebrity Cruises has limited ways in which it can introduce potential customers to the service. They can’t give free trials periods or free samples. They can’t offer a free limited experience with more expensive packages available. Trigger may not be a household name but it probably should. 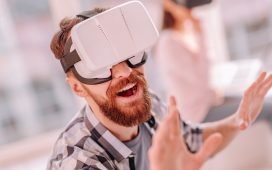 The company has worked to produce XR experiences with big names including Disney, Lego, Sony Pictures, Travelocity, and The Black Eyed Peas — and that’s only in the past few months. When Celebrity Cruises was getting ready to launch its newest ship, The Celebrity Edge, they wanted to bring the ship to the people. They did this by enlisting the help of the AR technology experts at Trigger. Together, they created an AR experience on its newest ship, The Celebrity Edge Access Tour app. The tour uses binaural audio, soundscaping and 3-D AR technology to give guests behind-the-scenes access to the story of their new ship. The part of an AR app that we tend to focus on the most is the imaging. In the case of games or other media, the imaging work takes place between designers and coders. Depending on the scale of the project, some elements may be repurposed from past projects or taken from open source libraries and edited. The initial steps of this process usually creates a rather lifeless model. Textures and colors can then be applied to areas of the render in order to make it more visually engaging. Smaller models of items, furniture, people, etc. can then be placed within the space. These can also be created, taken from a library, or taken from files used in the design of the actual items. These features can make the experience more interesting and fun but they also serve the practical purpose of helping to establish scale. Creating these models and spaces is only one aspect of image creation. The quality of the images make a big difference, especially in immersive experiences. Image quality is measured in megapixels. Each megapixel is made up of one million pixels. The number of megapixels in the measure is how many megapixels make up a single point in an image. All of the AR experiences in the Celebrity Edge Access Tour App are 12 megapixel. That’s the same image quality as the rear-facing camera on the most recent iPhone. Image is important in AR technology but the more immersive an experience should be, the more important sound becomes. The quest for sound quality begins with recording and editing. The audio in the Celebrity Edge Access Tour App consists primarily of a tour-narration and “soundscapes”. Recording narration is simple enough but creating a soundscape can be different. Soundscapes are all of the sounds that you would hear in a physical space. Depending on what the developer needs, these can be recorded in a real environment, or can be created. As is the case for images, there are libraries full of individual sounds that can be amplified, edited, and compiled into a soundscape. Creating a soundscape for an AR app might require a standard or edited recording or a natural soundscape, creating a soundscape from a library, or including library sounds into a recorded soundscape to change the experience. To create more immersive experiences, recording isn’t enough. The sounds in the Celebrity Edge Access Tour App are binaural. Binaural recording uses two microphones to record the environment, in a sense, from different angles. The result is that when the audio is played it sounds as though it is coming from around the listener rather than just through their earphones. Most AR apps don’t get that advanced, though similar technology is often used in VR settings. Controls are important in AR apps as well but are not usually a large obstacle. Things like navigating through and interacting with environments are more a problem for VR. Like VR, AR technology does require access to some form of hardware in order to use the camera and sensors that help to match movement in the real world with movement within the feature. These tools are easily accessible enough to small-time coders through tools like ARCore and ARKit. For a big-time developer like Trigger these aspects pose little difficulty. Other interactions are mere lines of code. The AR app is free and is available for both Apple and Android devices, though many of the features are only available if you are on the ship. Early reviews also say that it doesn’t work with some mobile devices, though the company has updated the app since the initial launch. The app is able to give a guided tour of various locations of the ship, including realistic audio both in terms of background sounds and a tour guide. The models of various parts of the ship help travelers to understand their surroundings before they encounter them. They can also can help them get used to the navigation of the ship so that they don’t spend the whole tour getting lost. The app doesn’t tour the whole ship but some of they key areas are included, as is a model of the outside of the ship.